KDSIM Charitable Trust (KDSIM Charitable Trust’s Era – A Play School & Era International School Malakapur Karad), Satara published a new job notification for Pre Primary Teachers, Drawing Teacher, Primary Teacher, Clerk & Principal Posts. The recruitment is for total 06 Vacancies. The willing candidates are informed to see the latest notification March 2019. Walk – in interview will be conduct on 27th March 2019. 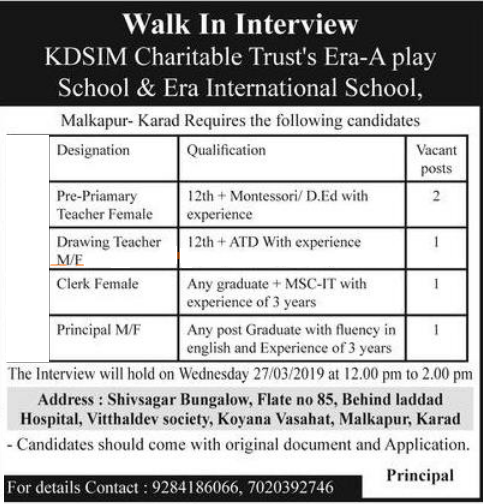 For More details of KDSIM Charitable Trust Recruitment 2019 Read Below. Interested & Eligible candidates may attend for walk in interview along with all the documents addressed at Shivsagar Bunglow, Flate no 85, Behind Laded Hospital, Vitthaldev Socity, Koyana Vasahat, Malkapur, Karad.